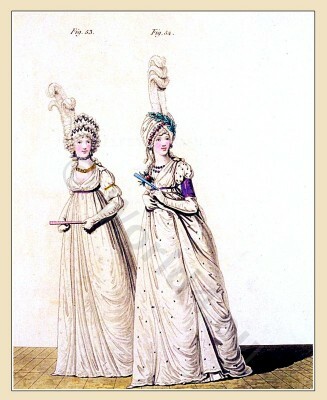 Regency Turban of Italian gauze. Lilac satin corset 1795. Home » Regency Turban of Italian gauze. Lilac satin corset 1795. Regency Turban of Italian gauze. Lilac satin corset. The Gallery of Fashion Vol. 2. Published by Nikolaus von Heideloff, London. Georgian fashion era. Costumes in the time of Jane Austen. The hair dressed in a high toupee; two ornaments of white satin in Vandyke scollops, the edges trimmed with silver spangles, placed in two parts of the toupee, and the hair betwixt combed into small curls; the hind hair in ringlets; three white ostrich feathers on the right side. Chemise of embroidered muslin; the collar and labels trimmed with lace; short full sleeves, tied in two parts with silver cords. Pink sash. Pearl ear-rings. Diamond necklace; and two small gold chains with a medallion round the neck. White satin shoes. The hair in small curls. and the hind hair in ringlets. Turban of Italian gauze, spangled with silver. A wreath of small roses on the right side; a branch of oak leaves, made of green foil, across the turban, from the left side to the right, in the front. Three large white ostrich feathers in the front, placed one behind the other. Petticoat of white muslin embroidered in silver, trimmed at the bottom with a white satin riband. Lilac satin corset without points; long sleeves of white satin, with a narrow blonde plaited at the wrists; short upper sleeves of lilac satin with full muslin tops, looped with a large pearl. Lilac-coloured sash. Diamond ear-rings. Two strings of large pearls round the neck. Lilac-coloured shoes. This entry was posted in 1795, 18th Century, England, Gallery of Fashion, Georgian period, Regency period and tagged England Georgian Era Fashion, Neoclassical dresses, Nikolaus von Heideloff, Regency period on 7/30/13 by world4.